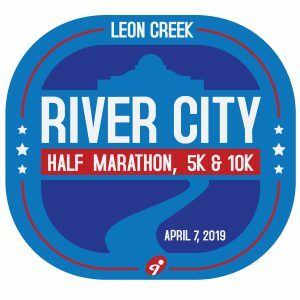 The River City Half Marathon 5k & 10k – Leon Creek was canceled. Unfortunately the weather didn’t cooperate. We are SO SORRY. Please click HERE to see a note about running in the Virtual Race. Custom Event Tech Shirts: Please register by Friday, March 29th to guarantee your shirt size! The River City Half Marathon 5k & 10k Leon Creek is a chip timed race with great aid stations, finish line food and awesome awards. The course runs along the beautiful Leon Creek Greenway in San Antonio, Texas. 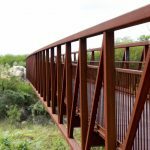 You will see some amazing local wildlife and great south Texas scenery along this paved trail. And of course, each participant will get an AWESOME tech shirt and finisher’s medal! 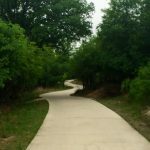 The Course: The Leon Creek Greenway is one of San Antonio’s hidden gems. 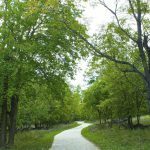 It is a wide, paved trail that extends for over 15 miles in length with water fountains and porta-potties along the way. The River City Half Marathon 5k & 10k will both start and finish at the Ingram Road trailhead (3215 Northwestern, San Antonio TX). This is an out and back race course. Aid Stations:We will have ample water and aid stations throughout the course. Our 5k participants will have two stations, 10k participants will have four stations and half marathon participants will have six aid stations to keep you hydrated and motivated throughout your entire 13.1 mile run! Packet Pickup: Saturday, April 6th at Fleet Feet San Antonio’s Quarry location, from 2pm – 5pm. You may pickup a packet for friend or family member. We will also have Packet Pickup available race day morning. However, please make every attempt to pick up your packet on Saturday. Staggered Starting Times: The Leon Creek Greenway is a public trail and is required to stay open (per City of San Antonio) during our event. Other runners and bikers will be on the trail and we will need to share it responsibly. To alleviate congestion on the trail, we will have a staggered start. At the start of the race, we will have a 3-5 second gap between runners. If you have a running partner, we will accommodate starting together. The Half Marathon will begin at 7:30am, the 10k will begin at 7:35am and the 5k will begin at 7:40am. The event will be chip timed, so your time will begin when you cross the starting line. Please follow trail etiquette and keep to the right of the trail. Doing so allows for two-way traffic. You can run side by side, however please use trail courtesy and allow runners to pass you on the left. You may need to run single file at times to allow people to pass you. By following proper trail etiquette, the race will go smoothly for everyone on the trail and we will have a great time. We appreciate your support with this. ATTENTION parents and dog owners:The River City Half Marathon, 5k & 10k is stroller AND pet friendly! We would love for you to run with your kiddos and your tame, properly leashed dog! The second race in the River City Challenge is over Labor Day Weekend, on Sunday, September 1st along the Salado Creek Greenway! Custom Event Tech Shirts: Please register by Friday, August 16th to guarantee your shirt size! 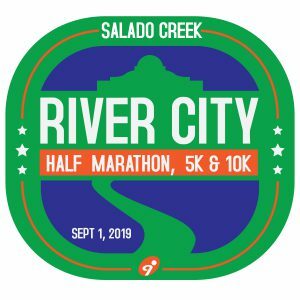 The River City Half Marathon 5k & 10k Salado Creek is a chip timed race with great aid stations, finish line food and awesome awards. 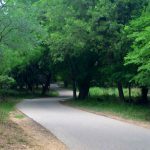 The course runs along the beautiful Salado Creek Greenway in San Antonio, Texas. 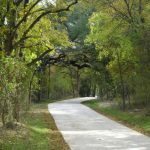 You will see some amazing local wildlife and great south Texas scenery along this paved trail. And of course, each participant will get an AWESOME tech shirt and finisher’s medal! The Course: The Salado Creek Greenway is one of San Antonio’s hidden gems. It is a wide, paved trail that extends for over 7 miles in length with water fountains and porta-potties along the way. The River City Half Marathon 5k & 10k Salado Creek will both start and finish at the Southside Lions Park East Trailhead (3100 Hiawatha, San Antonio TX 78210). This is an out and back race course. Packet Pickup: Will be announced soon. Stay tuned! Staggered Starting Times: The Salado Creek Greenway is a public trail and is required to stay open (per City of San Antonio) during our event. Other runners and bikers will be on the trail and we will need to share it responsibly. Charity Sponsor: We will be announcing our charity sponsor soon! ATTENTION parents and dog owners: The River City Half Marathon, 5k & 10k is stroller AND pet friendly! We would love for you to run with your kiddos and your tame, properly leashed dog!